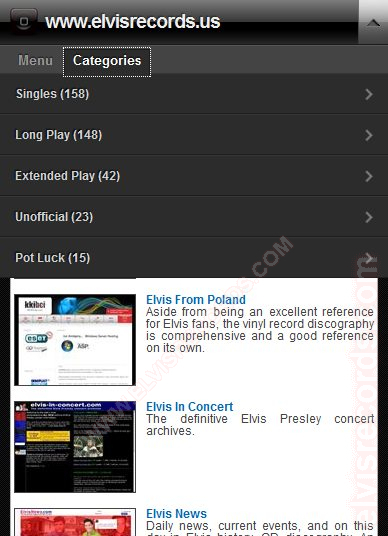 We are now the new and improved www.elvisrecords.com! 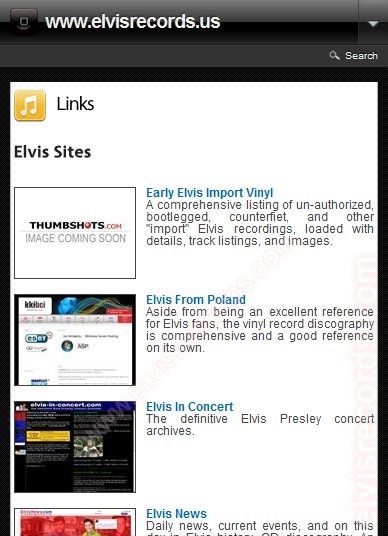 We have grown from www.elvisrecords.us, so please update your bookmarks. We have applied an SSL certificate. 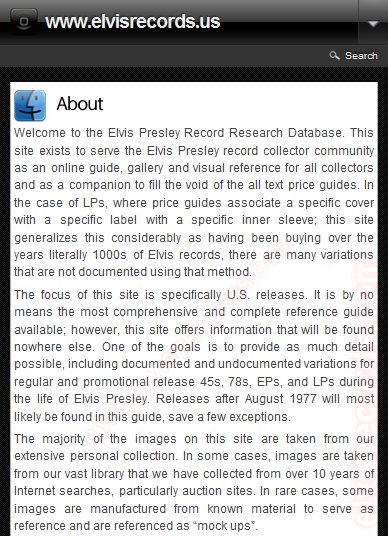 Welcome to the Elvis Presley Record Research Database. 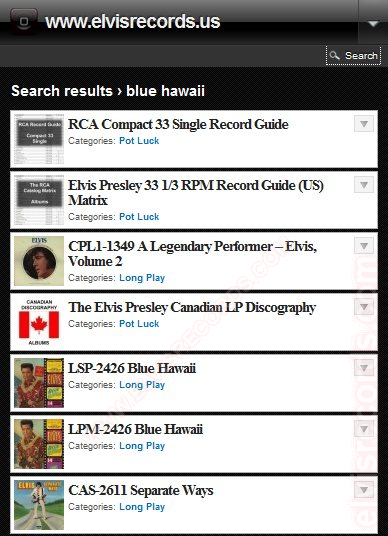 This site exists to serve the Elvis Presley record collector community as an online guide, gallery and visual reference for all collectors and as a companion to fill the void of the all text price guides. 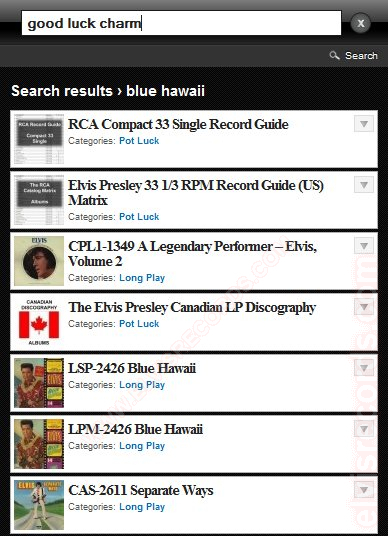 In the case of LPs, where price guides associate a specific cover with a specific label with a specific inner sleeve; this site generalizes this considerably as having been buying over the years literally 1000s of Elvis records, there are many variations that are not documented using that method. The focus of this site is specifically U.S. releases. It is by no means the most comprehensive and complete reference guide available; however, this site offers information that is found nowhere else. One of the goals is to provide as much detail possible, including documented and undocumented variations for regular and promotional release 45s, 78s, EPs, and LPs during the life of Elvis Presley. Releases after August 1977 will most likely not be found in this guide, save a few exceptions. The majority of the images used on this site are from our extensive personal collection or from our vast library of Internet images collected for over 15 years. Other images are from various collectors and other contributors and are referenced accordingly. In rare cases, some images are manufactured from known material to serve as reference and are referenced as "mock-ups". 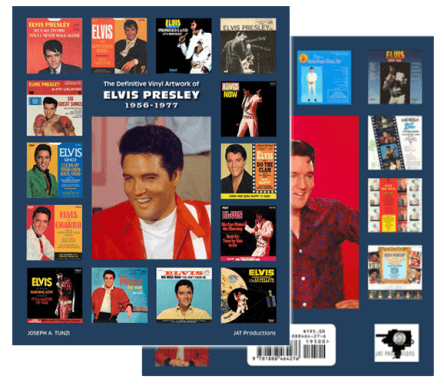 The Definitive Vinyl Artwork of Elvis Presley 1956-1977 (December 2015) contains most of the original photography for the albums, singles and extended plays released in Elvis Presley's lifetime. elvisrecords.com is proud to have collaborated with Joseph A. Tunzi on this exceptional book. 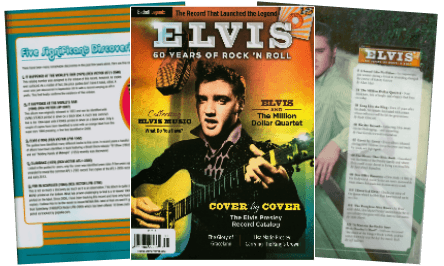 Beckett Legends: Elvis 60 Years of Rock 'n Roll (October 2014) features a 20 page spread of Elvis records scanned and provided by www.elvisrecords. [com], including a small commentary with collector tips and highlighting some recent important album revelations and discoveries. There is a reference to this site at multiple locations including the table of contents on page 2. 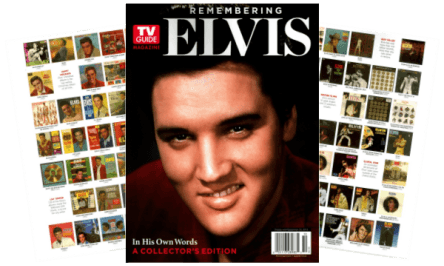 TV Guide Magazine's Remembering Elvis, In His Own Words, A Collector's Edition (August/September 2014) features a two-page spread of Elvis records from images scanned and provided by www.elvisrecords.[com]. There is a reference to this site at the bottom of the table of contents page. The default page is the About / Homepage. Use the from the top right corner to access all the pages and categories. The default tab is Pages. Press Categories for Categories and press the desired category to access that category. 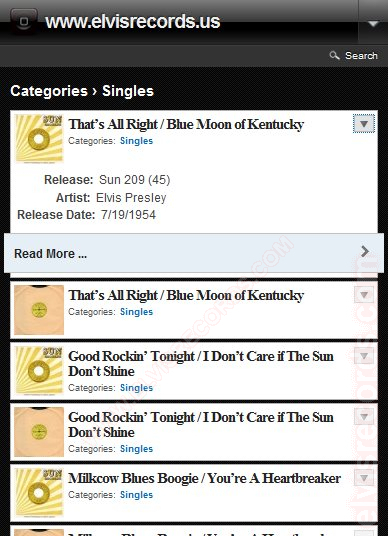 An example of having selected the Singles category. Press the arrow located next to the title for additional information. Press Read More ... for more detail. Using the Search will display a box at the top. Type in the desired search terms and press enter for the search results. Use the from the top right corner to access all the pages and categories. The default tab is Pages. For example, selecting Sitemap will present a sitemap of the website or by selecting Links will present the Links page of the website. Here is a list of sites that are using content from this site or our sister site and is using it on their site as their own. In some cases, the images that have originated from this site has even been re-branded as theirs. What none of these sites possess, and I do, are the original scans prior to being panoramically combined. This is a dangerous practice as it certainly does NOT encourage the development of this website nor is legal. It is not being suggested that these sites knowingly have taken content for their personal use as users may have submitted content to the sites. However, this list of sites are those sites whom have been contacted and have not yet corrected the problem on their end. Added to Collector's Weekly September 26, 2011) as a Hall of Fame site. Where current acknowledgments for specific images or content are displayed with each submission, this section exists for past contributors. These contributors are as appreciated now as were their original submissions. This list may contain contributors whom still have acknowledgments throughout the site, this is as a result of a specific submission being omitted or replaced completely. I am not the authority on the Elvis Presley U.S. Catalog; however, I am an extremely knowledgeable and an avid collector. I feel that I have something to offer to the collecting community. The information on this site is only as accurate as what can be found during research. I don't pretend that everything I have documented is 100% accurate or complete. Some information may be inaccurately presented, documented, of incomplete. This may be as a result of the data collected from other sources, incorrectly typed, or conclusions that had been made on material that either had not been documented or where documentation had not been located. Where this may be the case, this information may serve as reference until corrected. Updates are always appreciated with supporting documentation. Elvis, Elvis Presley, Elvis Week, Graceland, and Heartbreak Hotel are Registered Trademarks with the USPTO. © 2010 Elvis Presley Enterprises, Inc. All rights reserved. 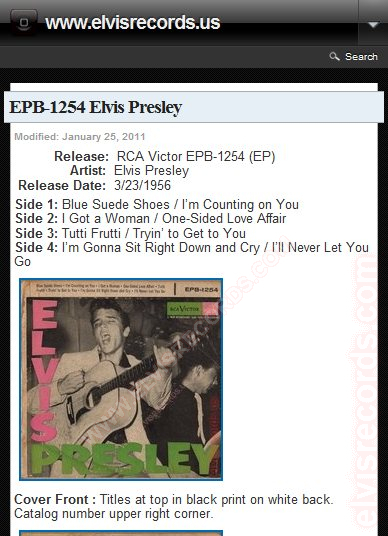 Elvis' recordings, the RCA Records label are © Sony Music Entertainment. All rights reserved. The "His Master's Voice" dog and gramophone image is in the public domain in the USA. 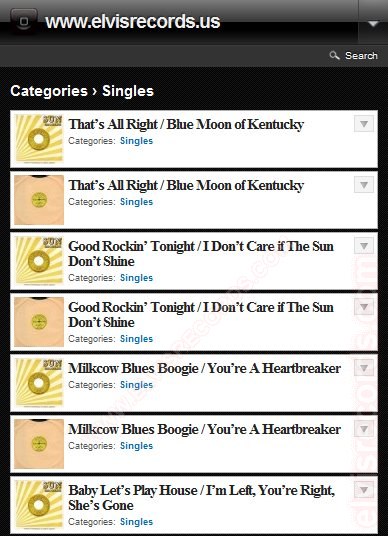 All other copyrights owned by their respective holders. 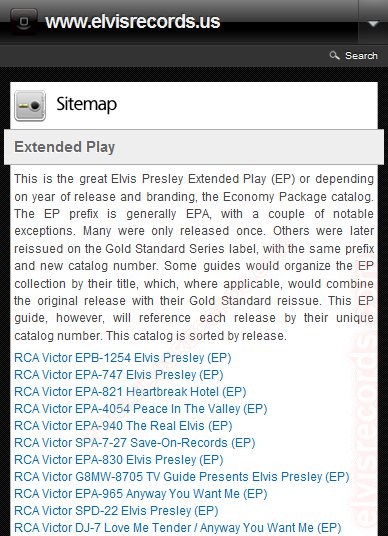 elvisrecords.com authorizes you to view and download a single copy of the material on this Web site("Web Site") solely for your personal, noncommercial use. The Contents of this Web Site, such as text, graphics, images and other material ("Material"), are protected by copyright under both United States and foreign laws. Unauthorized use of the Material may violate copyright, trademark, and other laws. You must retain all copyright and other proprietary notices contained in the original Material on any copy you make of the Material. You may not sell or modify the Material or reproduce, display, publicly perform, distribute, or otherwise use the Material in any way for any public or commercial purpose. The use of the Material on any other Web site or in a networked computer environment for any purpose is prohibited.